Human beings have become the most highly evolved form of life on the planet. This evolution has come about from our one unique quality that elevates us from other life forms. Our consciousness, defined as the sum total of our thoughts. Our thoughts are the most powerful tool we have, yet we often do not know how to use them! When we are born into this world we do not come with operating instructions, we are left with having to figure things out for ourselves through our life experience, trial and error. Our parents and teachers do not instruct us as how to direct our thoughts in order to create our life experience. Instead, they warn us of the “dangers” to be aware of. Donʼt do this, don't do that, stay away from this, it could kill you! We are taught that there are more things to be afraid of than there are to embrace. So we live our lives in fear, on the lookout for things getting us, cancer, evil doers, Republicans, Democrats, mosquitos carrying dengue fever, a plane crash, a tsunami. F.E.A.R. is an acronym for False Evidence Appearing Real. That false evidence is based on our previous experience that is in the memory of our thoughtware. Every experience we have is logged into our thoughtware together with the corresponding emotion that accompanies it. When we have a traumatic experience, the circumstances surrounding that experience along with fear is embedded in our memory. When we experience love and peace the circumstances and emotion are also embedded. So, we become a reactive computer board so that when similar circumstances appear again, we react to our previous experience. Every negative past experience we have becomes an obstacle we have to overcome by releasing its grip on our psyche, letting it go gently and then allowing the well-being, which is always present, to flow to us. Every positive experience we have we long to repeat and thus look for identical circumstances that we, mistakenly, think will bring us the same positive emotions. When I was in my teens I used to love to play pinball machines. I invested much time and many quarters trying to become a pinball wizard. In the beginning I would flail away at the flippers just trying to keep the ball in play and hoping that I would rack up points by haphazardly hitting the targets. That technique was frustrating because I did not have any control over the outcome and I rarely earned enough points to win a free game. Then one day I observed a master player at The University of Michigan in Ann Arbor. This student was able to control his flippers in such a way as to hold the ball and deliberately aim at specific targets in order to rack up the most points and free games which he then sold to other students. Observing his method was a revelation for me and I began to practice this technique, my relationship with the game of pinball had been changed! Our lives are a game of pinball. When we are unaware and unconscious we are flailing away, hoping we get lucky and hit some targets before we die. But when we Wake-Up! and become aware that we have the power through our focused thoughts and attention to control our flippers and deliberately aim at what we want to create, we achieve mastery and the ability to manifest our dreams and desires. Food is fuel for our bodies. When we are taking care of our bodies and giving it fuel that is high in nutrients we feel good and perform at a high level. More of us are eating SuperFoods and can feel the LifeForce energy they contain. Organically grown Freshly Roasted and Freshly Ground 100% Arabica Coffee is a SuperFood for our brains the most powerful tool that we, as human beings possess. Coffee enhances the performance of our brains through assisting us in increasing our ability to focus our attention while stimulating thoughts of creativity and inspiration. Coffee, like other SuperFoods, must be consumed fresh, by fresh I am talking about after the coffee bean has been roasted. 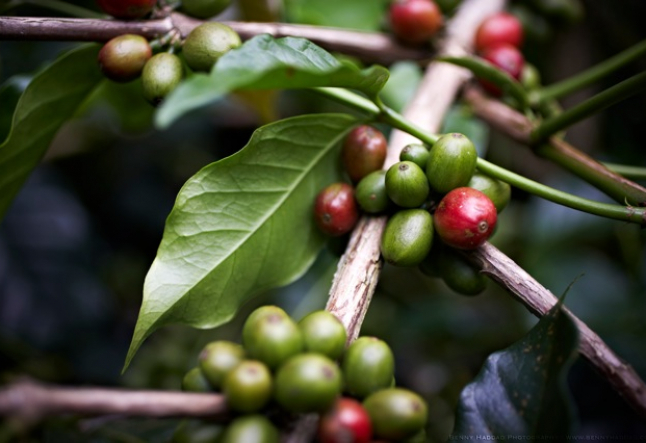 Coffee can be stored for years in its green state, but after roasting it is alive and vital, as a SuperFood, for less than a week. It also must be freshly ground. Once coffee is ground oxidation happens immediately and the coffee goes stale after just a few hours. There are over 1500 chemical compounds in fresh roasted coffee. 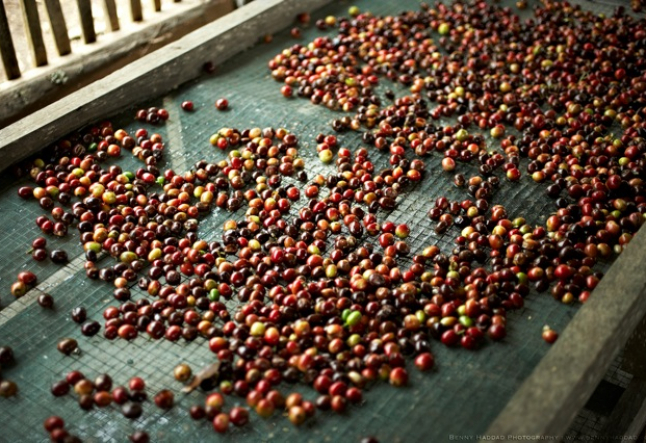 After roasted coffee is cooled, it takes several hours for the beans to settle before reaching their peak potency. My personal tests have determined a post roasted peak time of 11 hours. After roasting there is a degassing process that occurs where the porous coffee bean is breathing out CO2 and other chemical compounds. 40% of the CO2 is lost after just 24 hours. The remaining 60% of the CO2 discharges over the next 6 - 7 days. As long as these gases and compounds are moving out of the porous beans, oxygen is prevented from moving in and destroying, through oxidation, what is left. Once the degassing process is finished, the coffee bean stops breathing and dies...its LIfe Force and vitality has expired. 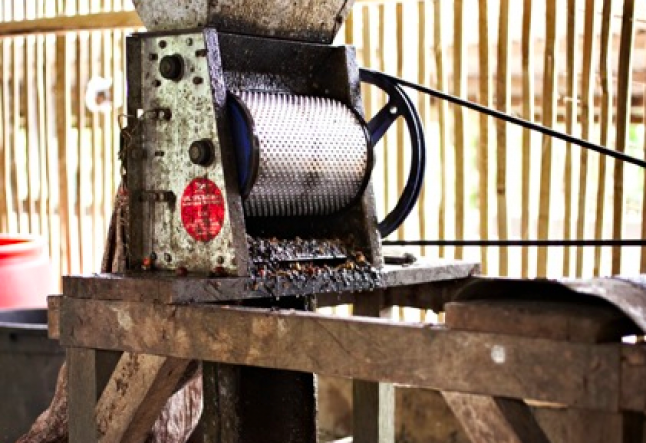 The oils that were created through the roasting process become rancid, the coffee is no longer Fresh Roasted. And vacuum packaging, refrigerating, freezing, or any other process cannot prevent this death and deterioration from occurring. 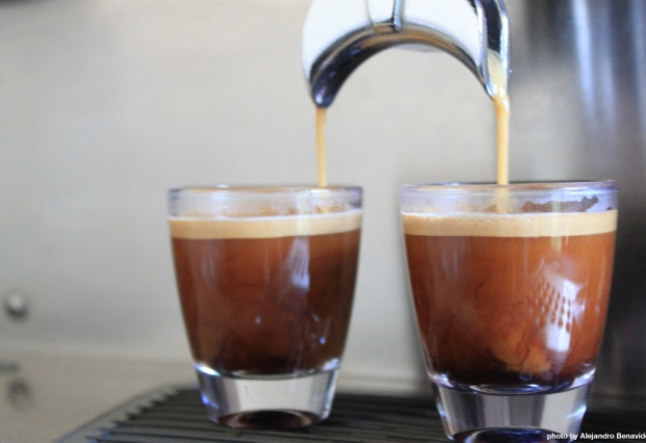 In fact, refrigerating or freezing coffee is more harmful than it is beneficial. You donʼt need special instruments to measure this, you can taste and feel the difference in your body! Our bodies are energy transformers and transmitters. Like batteries, we need to have the right balance between acidity and alkalinity to transmit energy efficiently. Most diets are heavily acidic which leads to obesity, listen to Jamie Oliverʼs TED talk on this subject. Coffee is one of the most acidic drinks and for that reason some doctors and health professionals do not recommend it for their patients whose diets are already heavily acidic. but there is a process of making coffee that naturally results in a liquid elixir that has 70% less acid. It is called Cold Pressed, or Cold Processed Coffee. It is made by soaking coarsely ground freshly roasted coffee in cold water for 24 hours. It is potent, smooth tasting, energizing and can be served hot as well as cold. Several years ago in southern Oregon I created a coffee roasting and delivery company called “Wake-Up”. I roasted and delivered my coffee locally to retail customers and was really enjoying the interaction I had with my customers who were very appreciative to receive their weekly fresh roasted deliveries. One day I got a call from a woman who had heard I was making a coffee product that was a low acidic alternative and wanted to try it. This woman was diagnosed as terminally ill, was on 18 different medications and her doctor would not let her drink brewed coffee due to its high acid content. When she told him about a low acid alternative he approved it and my Cold Pressed Coffee deliveries to her commenced. Every time I delivered my coffee to this womanʼs home, she would tell me how important my coffee was for her. She reported that she so looked forward to having her morning cup of cold pressed that it got her out of bed in the morning. She said the coffee was more powerful than all of her medications, it helped her mind function in a clear and focused way, it elevated her mood, and it also acted as an effective pain killer. I believe organically grown, fresh roasted and freshly ground Arabica coffee is a powerful tool for our brains and healthy for our bodies. When used in the proper doses, it is energizing and assists us in directing our attention and focusing our thoughts to be the powerful creative geniuses we came here to be! But donʼt take my word for it, test it for yourself and see if you can taste and feel the difference in your own mind and body. I think you will discover, as I have, that “Fresh Roasted Always Tastes Better!”.